UNTIL recently, I’d never understood the attraction of cruising. While there’s obvious appeal in lazing on a sunbed watching idyllic bits of the world float by from beside a swimming pool, I’d always felt cruises seemed aimed at a different type of traveller to myself – namely hard partying singles with a penchant for blue cocktails, or the more mature types in matching tracksuits. That was until I boarded Wind Surf. Now, after a glorious six-night round trip from Rome along Italy’s Amalfi coast, I get what cruising is all about – seeing the world one port at a time, with a floating luxury hotel following at your heels. And fellow passengers who quickly become friends. Wind Surf is the flagship of the fleet for cruise operator Windstar, and from the moment you spy it in the harbour, it’s clear the company’s official tagline ‘‘180 degrees from ordinary’’ isn’t just advertising spin. Docked next to the other cruisers – some looking more like apartment blocks than boats – Wind Surf’s elegance is immediately apparent. Carrying only 312 passengers, it is intimate, for starters. But Wind Surf’s real point of difference is its sails – a set of seven majestic, white triangles that crown the ship and give it an air of old-world romance. With its crisp, white exterior, teak decking and brass fittings, Wind Surf has a beautifully classic look – it’s the kind of ship you can imagine A-list celebrities avoiding the paparazzi on. The kind of ship James Bond would sip a martini on. It’s sleeker, swisher and much, much prettier than your run-of-the mill liner. Spirit and Wind Star – is not actually a cruise liner at all. Technically motor-sail yachts, the ships in the fleet are equipped with these billowing white sails that unfurl at the push of a button on the captain’s bridge, and can be used to propel the ship when the conditions are right. Its passengers are different, too. Far from being the odd one out on a ship full of ‘‘cruise junkies’’, I find I am right at home with Windstar’s clientele – a third of the company’s customers are first-time cruisers, just like me. And while the ship itself looks permanently polished and posh, its passengers certainly don’t have to be, with a ‘‘casual’’ dress code in place. Wind Surf may be good looking, but it is what’s on the inside that counts – and that’s pretty impressive, too. Check in using the ultra-hi-tech security system – every passenger gets their own photo ID keycard and leather carrying pouch – and head to one of the 156 luxury rooms spread across three levels to discover why Wind Surf is far from ordinary. The 20-year-old ship underwent a multimillion-dollar facelift four years ago and now boasts thoroughly modern accommodation, including two new deluxe ‘‘bridge suites’’, each with its own living room, entertainment centre, dining area and spa bathrooms (yes, plural – each suite has two, handy for ‘‘his and hers’’ travelling). Just as the sails set Wind Surf apart in the harbour, it’s the little differences that make it so enjoyable. All guest bathrooms are stocked with Egyptian cotton towels and robes, and bath products by cult French brand L’Occitane, and the showers feature custom heads with three pressure settings. Each suite has two flat-panel televisions – one for the lounge area and one for in-bed viewing – and a DVD player for films borrowed from the huge on-board library. touch to find iPod docks in all the rooms. You can even borrow an iPod Nano preloaded with songs from reception if you don’t have one. My partner and I are ecstatic at the notion of providing our own soundtrack for the trip, but what to play for cast off? He votes for Back in Black but AC/DC hardly seems appropriate for such tranquil surroundings. ‘‘AC/DC? The lead singer, Brian Johnson, he was a passenger on here not so long ago,’’ the porter remarks as he shows us around the room. So with Angus Young’s guitar riffs ringing in our ears, we depart Rome’s port of Civitavecchia on an overnight journey to our first stop – the tiny island of Ischia. It’s here we discover another benefit of travelling with Windstar. Because their ships are smaller, they can go places larger cruise ships bypass – Ischia being one example. This is reflected in Windstar’s itineraries, which often take in smaller or out-of-the-way places the big liners avoid. 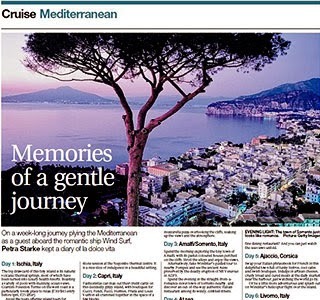 As well as Ischia, our cruise visits Capri, Amalfi and Sorrento. But with so much to experience on board, it’s hard to know whether to go ashore at all. Wind Surf features four restaurants offering distinct cuisines, from fine dining to modern fusion to an open-air grill, all with a vast wine list that even contains a few Clare Valley gems. And of course there’s always the 24-hour room service. Overindulged? Head to the gym or the Wind Spa, which offers everything from manicures to Ayurvedic massage and teeth whitening. There’s also a casino, library, cafe, four bars and a boutique. And with two swimming pools, two spas and four decks peppered with Balinese sun beds, there’s no trouble finding a spot to work on your tan. Sipping wine on the candle-lit deck as the moon sparkles on the ocean and we head to another picture-perfect coastal spot, it’s not hard to understand why Windstar has been crowned the world’s ‘‘most romantic cruise line’’ for five years running. The whole experience almost forces one to fall in love – with cruising. The big drawcard of this tiny island is its natural volcanic thermal springs, most of which have been turned into luxury health resorts. Boasting a variety of pools with stunning ocean views, Giardini Poseidon Terme on the west coast is a particularly lovely place to relax (j30/$43 entry before 1pm, j25 after). Avoid the touts offering island tours for hundreds of euros and catch one of the reliable local buses instead for just j1.30. You can see most of the island in a little over an hour. Windstar Cruises also offers passengers a guided island tour that includes a massage or hot stone session at the Negombo thermal centre. It is a nice slice of indulgence in a beautiful setting. Fashionistas can max out their credit cards on this decidedly glitzy island, with boutiques for Gucci, Fendi, Pucci, Hermes, Prada and Louis Vuitton all crammed together in the space of a few blocks. For those interested in more natural beauty, Windstar offers an excursion to the Blue Grotto, Capri’s famous, eerily blue ocean cave. It is busy but well worth seeing. Finish the day with a wood-oven buffalo mozzarella pizza overlooking the cliffs, soaking up the views and the atmosphere. Spend the morning exploring the tiny town of Amalfi, with its pastel-coloured houses perched on the cliffs. Stroll the alleys and enjoy the views. Alternatively, take Windstar’s guided tour to nearby Pompeii and see the ancient ruins preserved by the deadly eruption of Mt Vesuvius in AD79. Spend the evening in the straight-from-a-romance-novel town of Sorrento nearby, and discover an out-of-the-way authentic Italian restaurant among its windy, cobbled streets. What better way to spend a day on board than with a dip in the pool, a spell in the hot tub, a white wine over lunch and a massage treatment in the Wind Spa, followed by truffle risotto in the fine dining restaurant? And you can just watch the sea views unfold. Swap your Italian phrasebook for French in this delightful town full of funky bistros, cool cafes and swish boutiques. Indulge in artisan cheeses, crusty bread and cured meats at the daily market near the harbour, just watching the world go by. Or be a little more adventurous and splash out on Windstar’s helicopter flight over the island. Much of this once-pretty town was reduced to rubble in World War II, so now it’s mostly used by tourists as a jumping-off point for nearby attractions such as Pisa, Lucca and Florence. You can catch the train to any or all of these destinations, or sit back and let Windstar arrange it all for you – it has bus trips to the famous leaning tower as well as a ‘‘Highlights of Florence’’ tour. Bid arrivaderci to the Wind Surf, but buongiorno to Rome – a morning arrival back at Civitavecchia gives you a whole day to explore the sights, depending on your onward journey. First published in Escape, July 18, 2010.